Lizzie Barrett: Oh, the life of a cat!! Oh, the life of a cat!! 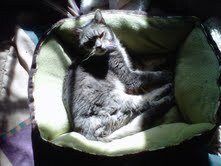 Tardy boy, sunning on his fluffy bed, enjoying the wonderful life of a loved cat.